Our Annual Christmas Poem . 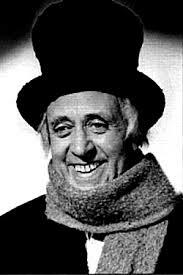 . .
Scrooge reformed kept Christmas well, of this we have been told. He carved a splendid turkey and was open with his gold. With festive songs and dancing and a bowl of right red punch. At work he gave Bob Cratchit leave to dawdle over lunch. Reflected his munificence and loaned, with nothing down. Urged him to make presents of his boundless currency. For brewer’s yeast and all the latest maritime sea charts. To him it was a nuisance like a mealy bug or thrips. They somehow thought it was all right when all their ink ran red. And perhaps the bankers could be treated less like scurvy. And pension plans were falling like old temples desecrated. And the people had to live in crates beneath eldritch elm trees. The government decided he had had the whole thing planned. And everyone did blame him for the loss of pound and pence. He had to go to Downing Street and beg to be acquitted. The Cabinet to New South Wales soon had his soul remitted. Now Scrooge amidst the dingoes celebrates on Christmas Day. He carves a roasted platypus for those at his soiree. When it gives to people nothing but Great Expectations. This holiday poesy is brought to you by Carl’s Jr. Honest food. Honest pleasure.